River restoration refers to a number of different strategies and techniques applied to enhance the natural state and functioning of rivers and catchments. 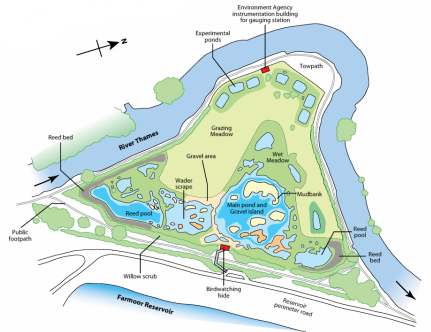 Several terms are used to describe works aiming to improve the riverine environment - such as rehabilitation, renaturalisation, enhancement, re-creation and mitigation - and river restoration is used as an umbrella term for these. Complete recovery of river processes and functions is often not possible to achieve due to irreversible catchment changes and socio-economic dependence on water resources and management. However, rivers are dynamic and have a remarkable ability to recover. The aim of river restoration is to assist this recovery and increase resilience by addressing hydrological, morphological, biological, chemical and societal issues within the catchment. 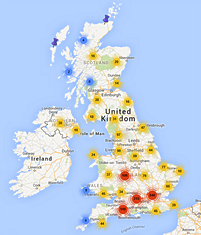 Rivers and their catchments provide a wide range of natural, economic and societal services. However, many activities such as channelisation, culverting, damming, abstraction, urbanisation, pollution, dredging and intensive agriculture can negatively impact the environment and the services rivers provide. River degradation has led to an extensive loss of habitats and additional pressures on the aquatic and terrestrial species that use them. It also affects the quality of our drinking water, resilience to climate change and ability to store and hold back flood water. Damage to river systems has been so extensive that an urgent need has emerged, not only to conserve, but to restore these systems. Best practice river and catchment restoration can deliver multiple benefits including improvements to water quality, biodiversity, water supply security and reductions in flood risk and pollution. Through legislation such as the Water Framework Directive (WFD), the Habitats Directive (HD) and other national and international agreements, we are compelled to improve and protect the water environment. 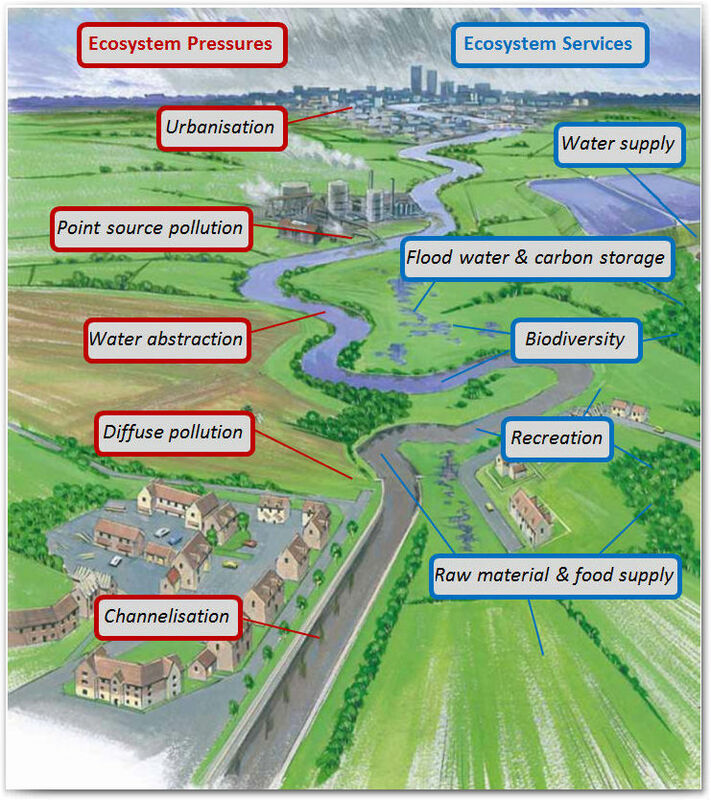 The WFD and HD are major drivers for restoration and sustainable water management in the UK. Illustration taken from Rivers by Design. There is clear evidence both globally and in the UK that climate is changing and that this is having an effect on the water environment. 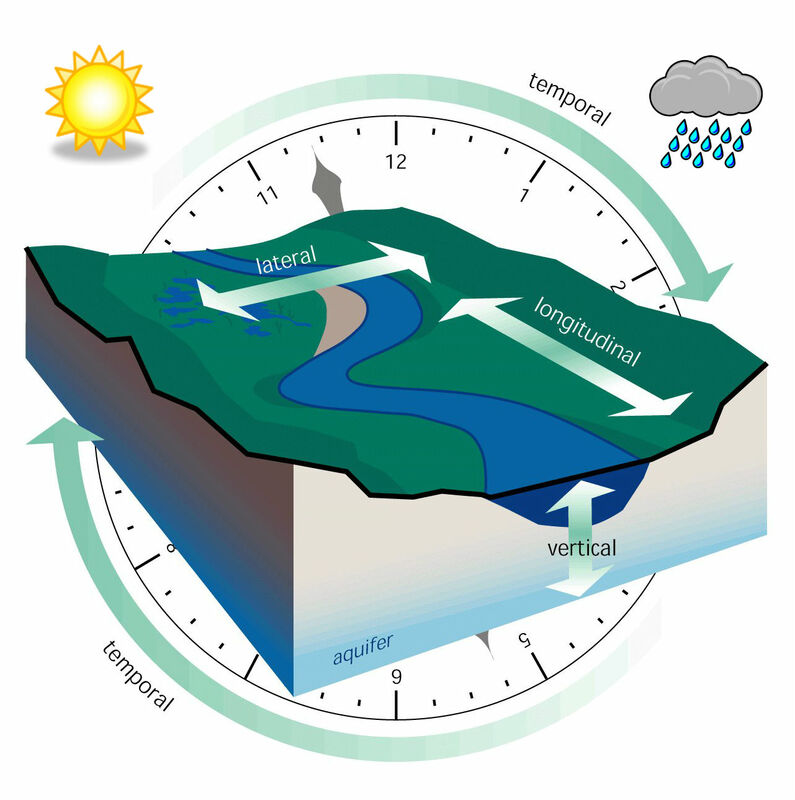 Particular risks include increases in rainfall intensity, river flow variability, drought frequency and water temperatures (putting for example salmonid fish at risk). River restoration is an important measure to mitigate against the effects of climate change. Heavily modified rivers are often less resilient and have lost their ability to hold water in both droughts and floods. Managing existing pressures on the water environment is key to building climate resilience. Priorities within river restoration to cope with future climate conditions include the reconnection of watercourses to their floodplains to help manage flood risk as well as drought. Riparian tree planting can provide shade and help manage water temperatures whilst broader catchment measures can improve soil structure and soil carbon, reduce over-abstraction and manage nutrient inputs. The importance of risks to the water environment and the need to integrate climate change adaptation into river management are recognised within the national Climate Change Risk Assessment and National Adaptation Programme developed under the Climate Change Act 2008. Details on the projections for future climate and how this might impact on river flows are nicely summarised in the LWEC Water Report Card. Furthermore the Keeping Rivers Cool guidance is a practical example of how we can keep water temperatures down by creating riparian shade. River restoration can be carried out at different scales and working with many different issues (such as morphological, hydrological, biological, chemical and socio-economic). The enhancement of river environments originally began with addressing issues of severe water pollution and the conservation of target species. But changes in attitude towards environmental management eventually led to more integrated river restoration schemes with multiple benefits. 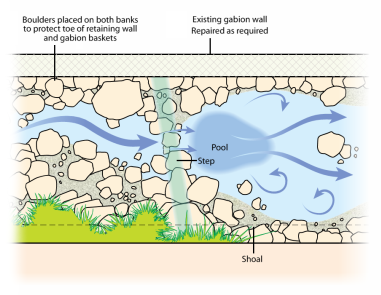 Below are a few examples of the most common measures within river restoration. 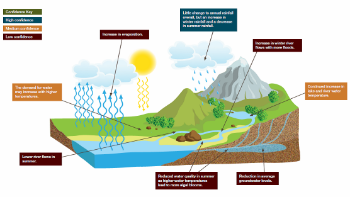 River systems are the result of the hydromorphological processes working in the catchment and are thereby affected by land use and catchment management. Working on a catchment scale by addressing critical issues such as diffuse agricultural pollution, water abstraction and barriers to lateral and longitudinal connectivity are some of the most important undertakings to mitigate against negative impacts on ecosystem functioning. Floodplains and wetland features are essential parts of a functioning catchment. They provide an important transition between aquatic and terrestrial systems, vital to many species, as well as other ecosystem services such as flood water retention, nutrient cycling and buffer zones. Due to large scale drainage schemes and urbanisation, wetlands and floodplains are some of the most threatened ecosystems in the world. 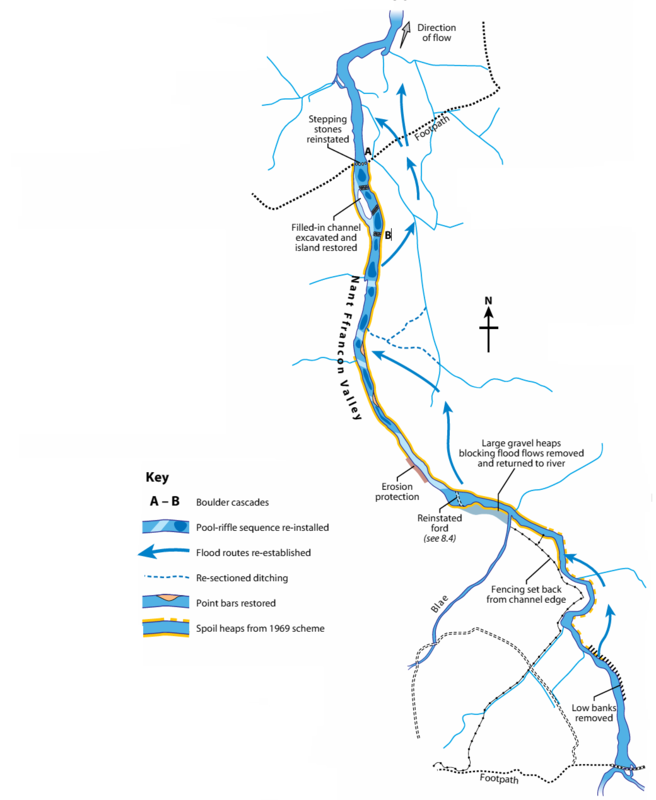 River straightening has been a common practice to create space, increase drainage and increase conveyance for perceived flood protection. A straightened channel lacks the flow and habitat diversity underpinning a healthy ecosystem and often leads to greater flood risk downstream. Reinstating a more natural morphological form and function can accelerate ecosystem recovery. Due to competing interests and infrastructural constraints, making space for river restoration is sometimes not possible, especially in urbanised areas. In these situations restorative measures might be limited to in-stream enhancements. These could include creating diversity by adding woody material, marginal vegetation or deflectors. 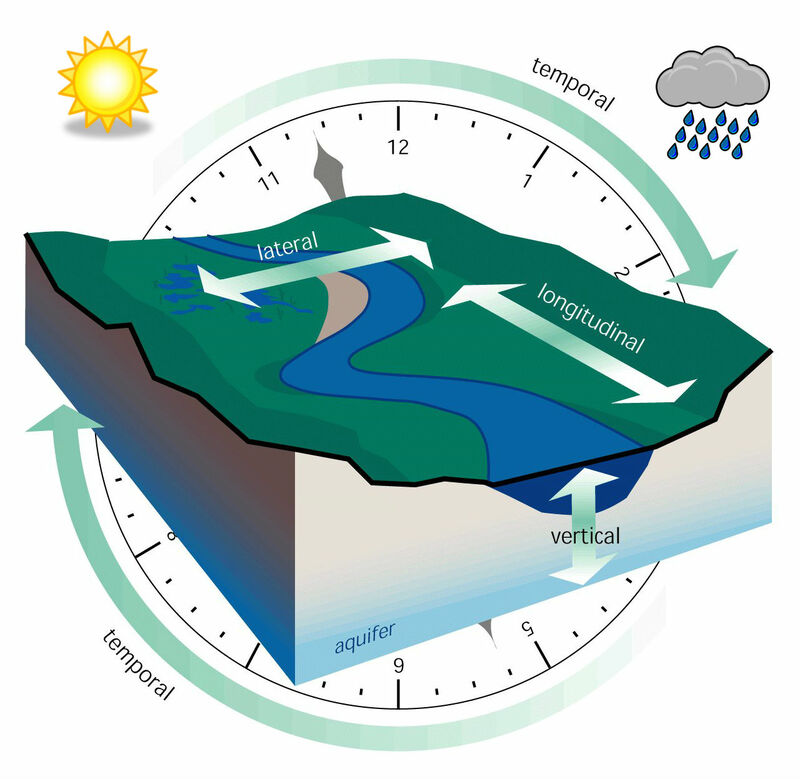 Rivers and aquatic ecosystems are highly complex networks working on several spatial and temporal scales. 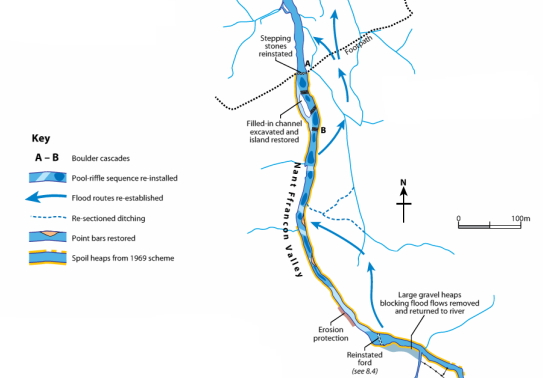 When restoring a river it is important to address barriers to the lateral connection between a river and its floodplain, the longitudinal connectivity within the river and the vertical connection with the groundwater. The dynamic nature of river systems and the many types that exist mean that there are no two identical systems and no ‘recipe’ for river restoration suitable to all sites. Each river restoration scheme therefore needs to be carefully tailored to the specific site. Effective river restoration is a multi-disciplinary task, involving among others ecology, geomorphology, hydrology and the social sciences. The complexity of fluvial ecosystems and the uncertainty in predicting physical and ecological responses requires an adaptive, continuous and open-ended approach to river restoration.